Do you like Race for the Galaxy? 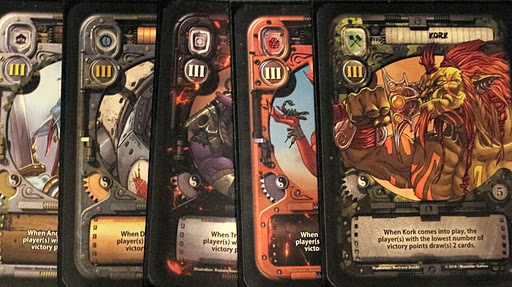 Do you like the mechanics and card interactions of a trading card game? Do you like goblins? Well then Gosu is the game for you. Even if you don’t fit into any of the above categories, Gosu provides a unique gaming experience that all board game players should try out. Players need to demonstrate tight resource management in order to succeed in this game. How do you do that? A frequent question in high level tournament play, the amount of cards in a player’s hand equals his available resource pool in Gosu. Cards are everything. You need them to pay costs. The more cards you hold, the more options you have available to you. Most importantly, without any cards you probably don’t have any plays! The simplest way to keep your hand size up comes from draw effects. Unlike other games, Gosu does not have a standard draw phase; therefore, you must rely on abilities to replenish your hand. Mind provides one of the most effective ways in balancing the scales. If you’re almost out of cards and your opponent(s) hold a hand full, slap this guy on the table and the game will change fast. 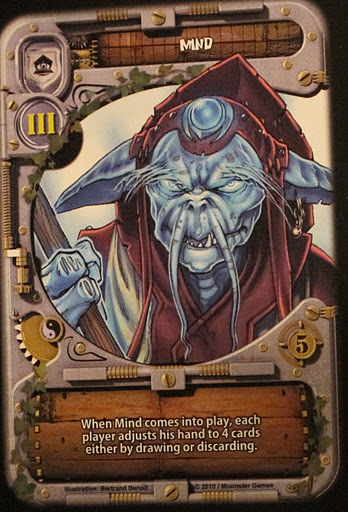 Many goblins give you bonus effects and draw you extra cards if your opponent(s) have more victory points than you. Take notice of how many of these types of goblins you draw. With a grip of several of these types of goblins, you may want to concede a round or two and maximize their benefit. The additional cards from these characters will sometimes push you over the edge, allowing you to take a commanding position after initially falling behind. Be careful of discard effects from you opponent. When you pass early, a hand disruption strategy will foil your ability to hold all these types of goblins for more epic turns in the next round. Leave your craving for Skittles at home. Attempting to support all five colors of goblins on your field will inevitably cost you too many cards. You may end up with every color after several mutations or in the final round of the game, but this should happen by accident. Do not plan to support every color. The cost of discarding extra cards for each level one goblin and mutating several times to achieve this goal with not return an appropriate amount of utility to your army. Focus on no more than three colors. When concentrating on a couple of colors, avoid filling up your first and second row too quickly. Take advantage of the mutate mechanic, and always leave space for level one goblins that will not cost you anything. Take a look at the picture below. Assume you have Meka Goblin Fiddler in the first position, Ancient Goblin Psi in the second position, and Meka Goblin Scout on the end. Instead of discarding two cards to play Fire Goblin Teleporter in the fourth slot, mutate out Meka Goblin Fiddler. Both ways will cost you two cards, but now you leave yourself with two spots open to play three different colors of goblins for free. Since Meka Goblin does not have a mutate power, you don’t even have to worry about not maximizing his effect. by paying the mutate cost. 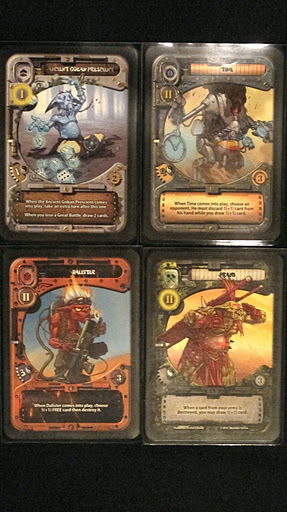 Knowing when and how to mutate your level one goblins will preserve several cards in your hand throughout the game. Most level one goblins mutate for two cards, but all level one goblins with zombie mutation require three cards. I recommend that you avoid mutating a dark goblin with zombie mutation unless you actually use the effect to switch to a goblin from the discard pile. You cost yourself an extra card compared to the other level one goblins. A player needs three cards to perform a standard mutation on a goblin with a mutation cost of two (two cards to discard and the goblin in hand that will replace the old one). A level one goblin with a zombie mutation cost of three costs a player four cards if they replace him with a goblin in his or her hand (three to discard and the replacement); however, replacing it with a goblin from the discard pile only costs a player three cards, allowing the player to preserve a card in hand. Some people might argue that some of the advice here splits hairs. 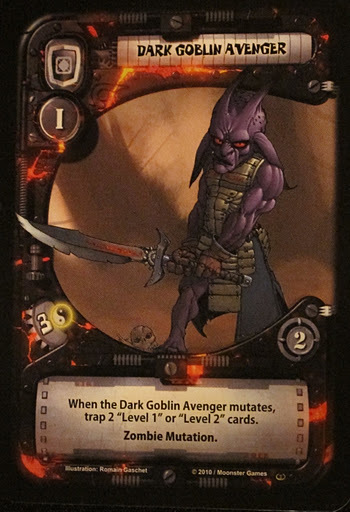 A gamer might say, “Well what if the goblin in my hand is the best guy to mutate into play versus my options in the discard pile for zombie mutating?” I want to stress that many games, including Gosu, require some kind of “game time decision,” where no handbook or guidelines will explain every move. Just keep in mind that a couple of cards can cost anyone from winning, so make sure you take advantage of every opportunity to maximize the cards in your hand. Any comments about this article? Post them below. For more information about Gosu check the product page on BoardGameGeek.com. I really like the concept of this website and I feel that this is a very unique and rare information that you have managed to compile. newsletter service. Do you’ve any? Kindly allow me understand so that I may just subscribe. Thanks. Once I finish giving the website a facelift, it will include all the features you mentioned here. Glad you enjoy the content.